The Bosch 1617EVS plunge and fixed base router fitted with a D-Handle style with a storage case for your router accessories have been engineered for both the beginner and master craftsman. It is a high powered and versatile design with 2-1/4 HP and a 12-Amp motor that delivers speeds of 8000 to 25000 RPM. It has both ¼ inch and ½ inch collets making it ideal for all your woodworking projects. 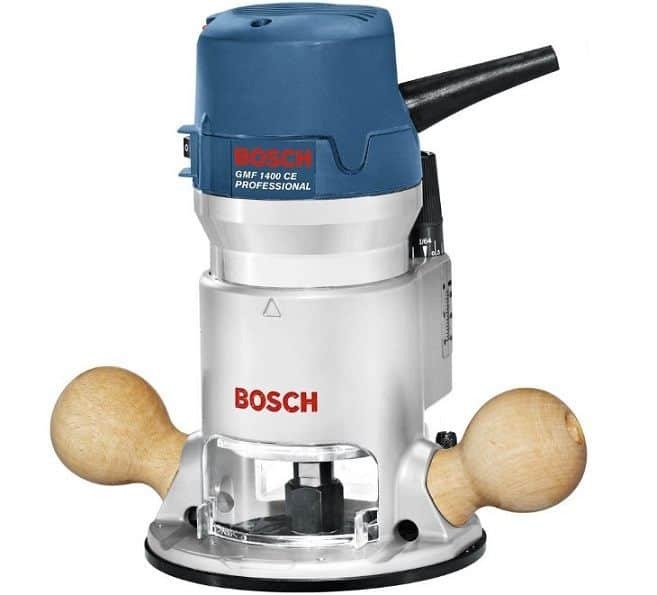 The Bosch 1617EVS has become a popular kit for most crafters in the woodwork industry. The router has a 12-Amp motor with a horsepower of 2-1/4HP. This is responsible for the speeds that move from 8,000 to 25,000 RPM. It has both the ½ and ¼ inch collets, which will be used to handle varied applications. The router comes with an electronic variable speed dial, which allows starting off smoothly and increasing the speeds depending on the load. The Constant Response Circuitry will be responsible for maintaining the speeds that have been preset during the process. The fixed base is easy to mount on a router table and helps in accomplishing an extensive range of routing tasks. It comes with a storage case that has compartments for all the accessories. The variable speed dial is electronic, which makes it easy to adjust so that the router starts smoothly. There is a T-handle hex wrench that is used for depth adjustments for the fixed base on a router table. However, this is optional. The router has a micro-fine adjustment that can go to the accuracy of 1/64-inch. It has the Precision Centering Design, which works well with the sub base to produce accurate results. The 1/2” and ¼” collets are the most significant feature for this wood router. They work well with the fixed base and the different bits that are changed in a snap. The two side handles, in the shape of knobs, which give the user maximum control of the router. There is a well-documented instructional guide that is provided in English, Spanish and French. The fixed base is built using aluminium and has a rugged design so as to ensure that it lasts. It has a Ra1161 fixed base that comes with mounting accessories. Includes ¼ inch and ½ inch collets that are self-releasing. Comprises of the drop-forged wrenches and wrenches that can be adjusted above the table. Runs on a 12 Amp motor with 2.25 HP and this allows spins of between 8,000 and 25,000 RMP. It also has an inbuilt Constant Response Circuitry, which will ensure that the speeds set will remain constant throughout the task. The soft-start feature is essential in reducing the torque upon start up. The power switched is completely sealed so as to prevent any dust from building up around it. The Bosch 1617EVS has an accurate locking mechanism, which will result in minimal spillage. It accommodates both the ½ and ¼ inch collets, which are self-releasing. The excellent side handles provide a firm grip and this enhances stability during tasks. It has a powerful 12Amp motor, which allows for speeds of between 8,000 and 25,000 RPM. The Constant Response Circuitry will monitor and maintain the preferred speed at a consistent RPM. It has mounting hardware and accessories included in the package. It comes with a chip shield. The power switch is well-covered so as to prevent any dust from settling there. It has the Precision Centering Design incorporated into the sub base for accurate performance. When you are changing bits, you would need to have two wrenches. It does not have an adapter to use with third party collars. You would have to acquire the template guide adapter separately. It does not have a provision for a battery. One has to be limited to the length of the electrical cord. The power switch appears to malfunction often, and one has to keep replacing it. The handle knobs are somewhat slippery and lack a firm grip. Setting up this router is easy and straightforward. All you need to do is familiarise yourself with the main components like the collets, base and the motor. Follow the manual to set it up on your working surface and adjust the depth and speed to your preference. Mounting accessories are provided to help in using it on a router table. Go through the safety instructions before starting your router. There have been several complaints raised in regards to the power switch, which keeps failing. You should always ensure that it is sealed so as to avoid any dust from collecting around the switch. Clean and wax the base frequently, so as to maintain it properly. Always store the components in their respective cases.